Asking the Question: What Is the Purpose of Public Education in a Democracy? Today’s blogger is Aaron Samuel Zimmerman, an Assistant Professor of Curriculum and Instruction in the College of Education at Texas Tech University, whose recently published article “Democratic Teacher Education: Preserving Public Education as a Public Good in an Era of Neoliberalism” appears in the special issue of The Educational Forum on educator activism in politically polarized times. In that article, he argues that teacher educators play an essential role in preserving public education as a public good. In your opinion, what is the purpose of public education? To prepare students with the skills they need for the workforce? To provide students with credentials that will facilitate their social mobility? To cultivate the virtues that students need in order to participate as active citizens within a democracy? Americans tend to hold multiple (and sometimes conflicting) priorities when it comes to public education (Labaree, 2011). We tend to believe that public schools can prepare students for democratic participation while simultaneously preparing students with the knowledge, skills, and credentials they need to advance in a capitalist economy. When we examine the current state of public schools in our country, however, we disturbingly find that schools tend to function almost exclusively as private businesses catering to consumers rather than as public institutions committed to preserving the public good (Ravitch, 2014). I understand this to be just one more symptom of neoliberalism, the political and economic ideology that places a premium on privatization and self-interest. At this point, the influence of neoliberalism in our country is so prevalent that we are hardly even aware that it consistently shapes our values and decision-making (Giroux, 2008). One need look no farther than Secretary of Education Betsy DeVos—and, before her, Secretary of Education Arne Duncan—to see the way in which neoliberal values have crept into public education. Parents are treated as customers, schools are positioned as businesses producing a product, and students are taught how to become diligent workers (and faithful consumers) in a capitalist economy. Sadly, teacher education tends to perpetuate neoliberal ideology. Most teacher education programs (both university-based programs as well as alternative routes to teacher certification) focus on helping teacher candidates learn how to raise student test scores (Kumashiro, 2010). Indeed, teacher quality is often measured by standardized test scores (Harris & Sass, 2011); but, unless teacher educators actively challenge this paradigm, early-career teachers will enter the profession assuming that high scores on standardized tests represent the ultimate goal of public education. Of course, this is not to say that we should never measure student achievement or teacher quality through standardized tests. Public education in our nation, however, is in danger of being completely overtaken by this neoliberal logic. Teachers in public schools do more than help students achieve a credential; public school teachers also play a formative role in sustaining democracy by cultivating the virtuous dispositions required for democratic participation (dispositions such as open-mindedness, honesty, imagination, and generosity; see Huber-Warring & Warring, 2006). Our country’s democracy will suffer if teachers and teacher educators do not actively defend public education’s democratic purpose. We need to remind ourselves that public education can do so much more than provide students with degrees, grades, and GPAs. Public education has the potential—and, perhaps, the responsibility—to nurture democratic citizens. What do you believe is the purpose of public education? Do you actively pose this question to the aspiring teachers whom you mentor? Do you pose this question to the members in the communities whom you serve? What are ways that we can collectively invite teachers, students, and, indeed, all citizens to reimagine the role that public education can play in our democracy? I titled this blog entry “Asking the Question” because, indeed, asking the question is half the battle. If we do not actively ask ourselves questions about the purpose of public education, other people will answer the questions for us . . . and those answers are likely to be justified only by a profit margin. KDP is proud to partner with Routledge to share an essay from the special issue of The Educational Forum with the education community. Access the article at Taylor and Francis Online, free through August 31, 2018. Giroux, H. A. (2008). Against the terror of neoliberalism: Politics beyond the age of greed. New York, NY: Paradigm. Harris, D. N., & Sass, T. R. (2011). Teacher training, teacher quality and student achievement. Journal of Public Economics, 95(7–8), 798–812. Huber-Warring, T., & Warring, D. F. (2006). Are you teaching for democracy? Developing dispositions, promoting democratic practice, and embracing social justice and diversity. Action in Teacher Education, 28(2), 38–52. Kumashiro, K. K. (2010). Seeing the bigger picture: Troubling movements to end teacher education. Journal of Teacher Education, 61(1–2), 56–65. Labaree, D. F. (2011). Consuming the public school. Educational Theory, 61(4), 381–394. Ravitch, D. (2014). Reign of error: The hoax of the privatization movement and the danger to America’s public schools. New York, NY: Vintage Books. Having taught Fine Arts for decades in New York City public school middle and lower grades, I was delighted to be invited to visit a Lower East Side Settlement House with the prospect of presenting an early childhood Reggio-inspired art program for their Early Head Start. Excited, hopeful, filled with plans and ideas of collaboration and artistic outreach to the community of my childhood—where my father, as a young boy, played on sports teams and my mother worked as a Settlement House secretary—brought tears of nostalgic joy. 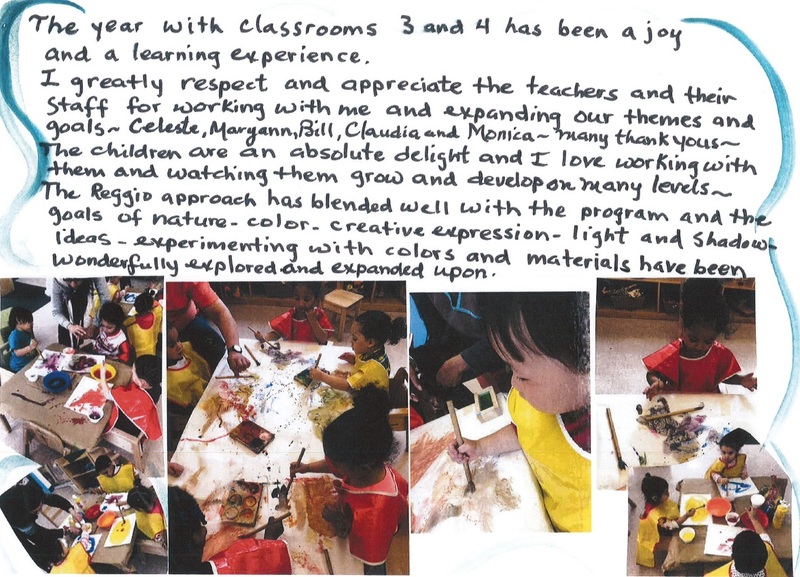 I studied Reggio concepts at Bank Street College, visited many Reggio-inspired nurseries, read countless books on beautiful objects, concepts, and methods for incorporating Reggio into American schools. I attended workshops and programs throughout New York City on Reggio philosophies. I was assigned two classes of older two-year-olds and met with each class for close to 1 hour once a week. Gaining their engagement, awareness, and reception to my program was not an easy task, as the teachers were quite set in their ways. Yet, I forged ahead to introduce a newer, more creative approach. My focus was on nature—the changing of the seasons, color, shapes, textures, incorporating awareness by seeing, talking, touching. We looked at the trees, the patterns on the leaves, and the natural world around us. As we transitioned from summer to fall, we looked at the light, the sun, shadows, and colors. I decided to transform the rooms through color and translucency by using tracing paper and opaque papers with collage and painting. Over the weeks, the children began to create wonderful panels that were placed on the windows. We created paper trees with leaves and crunched up tissue paper in orange, green, and red hues. We observed the branches of trees outside our room dancing in the shadows of our window shades and made crowns of leaves for our hair. Our winter trees became snowy and bare. The blues, whites, silvers, and greys of winter were dramatic on the windows. Panels of cotton ball snow and ice were created with paint and mobiles attached to twigs. Spring heralded soft greens and pinks, yellow and lavender-blue colors in paint and collage. Our spring exploded in tissue paper blossoms and birds in nests, eggs, and flowers on our spring tree. We made fairy head pieces for our hair and looked at the trees in blossom. We also explored with clay and created stabiles referencing Alexander Calder’s works using our own pipe cleaners, tissue paper, and found objects. I encouraged the teachers to follow through with documenting techniques of inquiry as the children had much to say and discuss. As my program winds down, I am hopeful that the staff will continue with the efforts I proposed and developed. The families and children were greatly inspirational and the need to explore and express ideas enriches and expands the capabilities of the children. 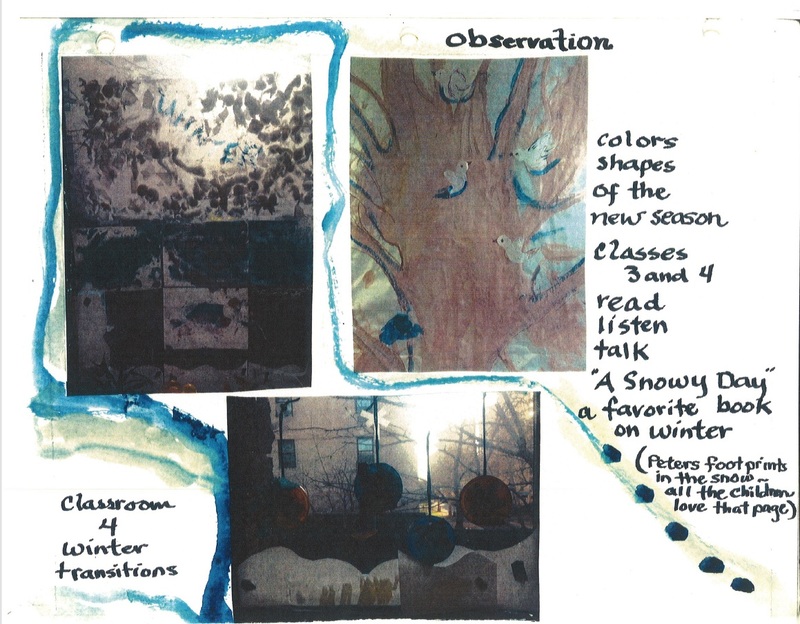 Working at the Settlement House was a great experience for me on many levels, and I appreciate the opportunity to connect as a teacher and artist—especially with the educational changes imposed by testing and the rigidity in learning. Creativity is vital, and children need to emerge and flourish through exploration and hands-on experiences. Art is a necessity for such development. 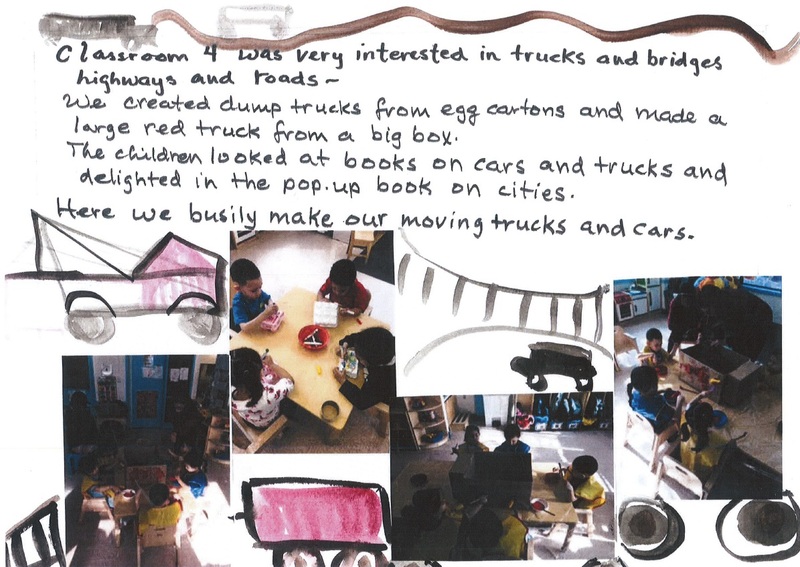 Today, many Reggio programs are based in private nurseries and learning facilities in inner cities, which is of benefit to children and families. Still, many families of very young children lack access to this exceptional teaching and learning method, which has the potential to support and nourish creativity within individuals, families and entire communities. Ms. Adele Phyllis Unterberg is an Art Teacher in New York City and has both a Bachelor’s and a Master’s degree from New York University in Fine Arts Education. 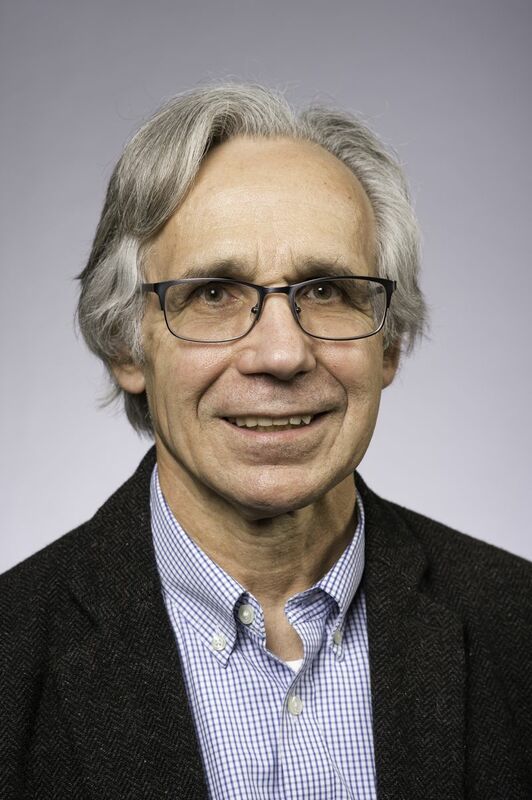 Today’s blogger is Dr. David Hursh, Professor of Teaching and Curriculum at the Warner Graduate School of Education and Human Development, University of Rochester. He writes here to describe research recently published in an article (coauthored by Dr. Camille Anne Martina) in The Educational Forum. In the United States, we are at a critical moment in society and schooling that demands our attention. Depending on who wins the upcoming elections, public schools may go in either of two directions. If the neoliberals win, schools may become increasingly privatized, as the support for and number of charter schools increase, and students and teachers will likely be subjected to intensified evaluation through standardized tests. Or, on the other hand, schooling could be redesigned to take advantage of what researchers have learned about supporting students’ thinking and the best ways to help students to tackle the crucial issues we face as a nation and global community. For example, schools could take the lead in preparing students to analyze the evidence regarding climate change, and to develop appropriate responses. Schools could also become models for democratic citizenship and serve as resources for their communities. In our article, “The End of Public Schools? Or a New Beginning?,” we show how philanthro-capitalists, non-governmental organizations, corporations, hedge fund managers, and state and federal commissioners of education promote a neoliberal way of thinking about the world that prioritizes individual entrepreneurship within a privatized market system. Readers of this blog will likely be familiar with a number of ways in which we see this at play in U.S. education today. Examples include the increase in the number of charter schools and voucher programs, and the constant portrayal of public schools and public school teachers as failing. The result of such influences is that teaching is transformed into following a script, and teaching becomes deprofessionalized as teachers lose protections including due process. In response to these threats, we urge teachers to develop a new way of thinking about the world: one based on promoting equality, ending poverty, solving problems, creating community, and supporting one another. We also suggest that teachers, parents, students, and university educators work together to show how critics of public schools misuse test scores and other data to inaccurately portray schools as failing. Teachers must be willing to enter the political process, work to prevent the end of public schools, and collaborate with their communities to transform schools into places where knowledge is created and shared with the aim of creating an equitable, democratic society. KDP is proud to partner with Routledge to share Dr. Hursh and Dr. Martina’s article free with the education community through March 31, 2016. Read the full article here. Standardized test results play an important role in the education landscape today. The results from state-mandated standardized tests are used to make multiple determinations and interpretations about teachers, school administrators, students, and school quality. In most cases, state education bureaucrats use the results from one mandated standardized test in mathematics and one test in English language arts for multiple purposes to meet the various Race To The Top grant and No Child Left Behind waiver reporting requirements for teacher and principal effectiveness as well as college and career readiness for students. The results from the state-mandated high school mathematics test in Grade 11 could be used to make determinations about (a) the effectiveness of the high school principal, (b) the effectiveness of the high school math teachers, (c) the quality of the school district’s mathematics program, (d) whether a Grade 11 student is college ready, (e) whether that student is career ready, (f) a student’s strengths and weaknesses in math, (g) Grade 12 course placements for that student, and (h) whether the student can graduate high school. That is eight determinations made totally or in part from one test score. If the test results have not been validated for making multiple determinations, then the decisions made about educators, students, schools, and school districts that are based on the results could be flawed. A current example includes the use of state test results to rank schools and school districts and to reward and punish them. As I elaborate upon in Education Policy Perils: Tackling the Tough Issues, results from state standardized tests can be predicted with a great deal of accuracy at the school and district levels, using only community demographic data. Some school and district educators are needlessly critiqued, replaced, or put on corrective action while others receive praise, all based on test results that have not been validated for making those types of determinations. The seventh edition of the Standards for Educational and Psychological Testing contains 12 categories of standards and provides specific guidance on topics that include appropriate test design, development, validity, and use of standardized tests and results (AERA, APA, & NCME, 2014). Standard 1.0 states, “Clear articulation of each intended test score interpretation for a specified use should be set forth, and appropriate validity evidence in support of each intended interpretation should be provided” (AERA et al., 2014, p. 23). Standard 1.1 expands on this guidance: “No test permits interpretations that are valid for all purposes or in all situations. Each recommended interpretation for a given use requires validation” (AERA et al., 2014, p. 23). Standard 1.1 further recommends, “A rationale should be presented for each intended interpretation of test scores for a given use, together with a summary of the evidence and theory bearing on the intended interpretation” (AERA et al., 2014, p. 23). For example, using a standardized test administered in Grade 3 to determine college and career readiness would potentially require a validation period of 8 years for the college readiness determination and longer for career readiness validation. College readiness and career readiness are two different determinations and require two separate validations of the test results to make those determinations. Similarly, one might argue for more evidence of validity in the case where an elementary school principal receives an ineffective rating based on school standardized test scores while the majority of her teachers are rated effective via the same test results. The authors of the standards present specific cautions about using results from standardized tests for multiple purposes in educational settings like P–12 public schools. A test designed to measure the effectiveness of a school principal may not be valid for measuring the effectiveness of a classroom teacher. The authors state clearly, “No one test will serve all purposes equally well” (AERA et al., 2014, p. 195). Users of standardized test results should attempt to confirm the results for groups and individuals by obtaining multiple forms of data about those groups or individuals. Data from various sources should be triangulated so that a decision is not made based only upon the results from a single state-mandated standardized test. Educators in a school could develop a menu of other indicators one could use to make important decisions about students and teachers without using any results from state-mandated standardized tests. They could create a simple matrix with the type of determination to be made listed on the left side of the matrix and all the existing sources of data at hand running along the top of the matrix. Then they would be able to easily identify determinations that lack at least three different types of data. That could help alert educators to the types of assessments they might have to develop in-house. More importantly, the exercise will help educators kick the habit of using results from one test for multiple purposes for which the test was not designed. Dr. Christopher H. Tienken is an Assistant Professor at Seton Hall University in the College of Education and Human Services, Department of Education Leadership, Management, and Policy. He is a former public school teacher and administrator. 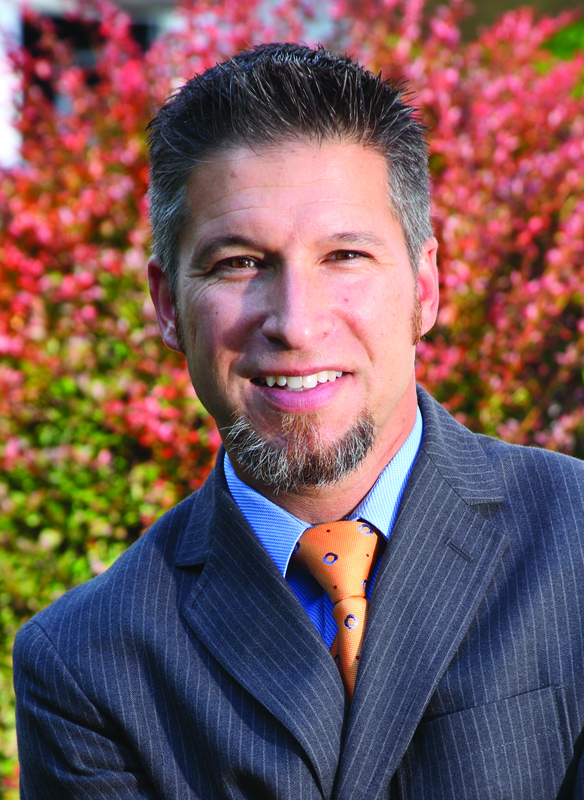 He serves as the Academic Editor of the KDP Record. Excerpt from Tienken, C. H. (2015). Test use and abuse. 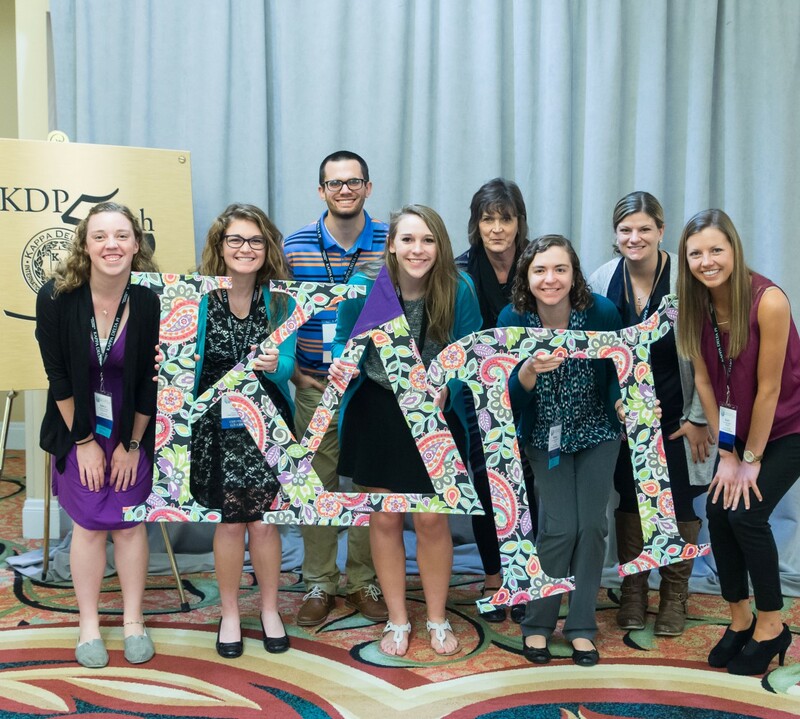 Kappa Delta Pi Record, 51(4), 155–158. Used with permission.